The 2019 Ford Mustang Shelby GT350 was hotly anticipated after the sixth generation Mustang upgrade last year. 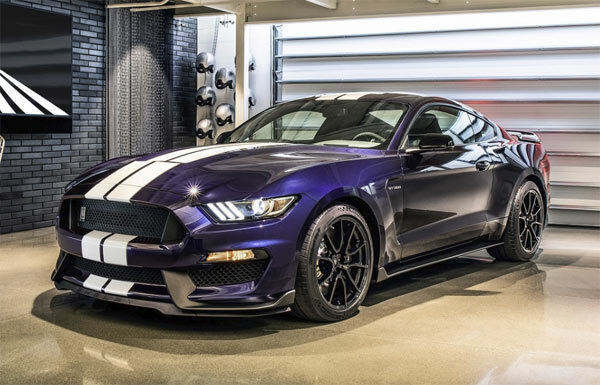 A rejuvenated Shelby GT500 should also be on the horizon, but the GT350 is the focus here. Everything really boils down to the 2019 GT350 being more or less the same as the sixth generation Mustang, with some tweaking and fettling hear and there to prove it is upgraded and new model. There is no new major facelift, the powertrain remains virtually the same, but there have been interior upgrades, better suspension, tires, and braking system. Externally, the biggest highlight is a new rear spoiler with optional Gurney flap giving better aero efficiency. There is also standard mirror-mounted Cobra projection lamps, new 19-inch aluminum wheels with redesigned Michelin Pilot Sport Cup 2 tires and two new exterior colors, Velocity Blue and Ford Performance Blue. Racing stripes still mandatory. The interior is largely the same, but does have a few changes. A new machined aluminum trim with carbon fibre option, new dark slate Miko suede door panel inserts, Recaro race seats with new power-adjustable functions and custom-tuned the 12-speaker audio system. The powertrain remains the same with the same reliable 5.2-liter V8 producing 526 horsepower and 429 pound-feet of torque through a Tremec six-speed manual transmission. At least you gets an upgraded MagneRide active suspension, being 10% stiffer upfront and 10% softer at the back. Braking is done via six-piston front and four-piston rear Brembo brakes with tweaked, power assisted steering. These changes along with the new rear spoiler should at least help you whizz around those corners a bit faster. The 2018 model retailed for $57,240, meaning this update should be a touch higher in price. Clearly these are not massive changes to the GT350, just enough to whet the appetite of those wanting the latest and greatest model. Maybe all the focus is going on the upcoming GT500 but even so, these changes keep the GT350 in the picturebut.